Are dire circumstances helping to renew focus on stigmatized mental health? Although advocates ended 2016 cheered by new legislation that increased funding and raised the priority of mental health in the nation’s health policy, the year also closed with stark reminders of how far the United States has lagged in this vital area. Two separate news investigations have painted dire portraits of how the lack of mental health care has led to criminal violence and killings, while another media probe found disturbing signs that a major hospital chain was too quick to question patients’ mental competency and then to hold them against their will. The deaths of two of Hollywood’s elites—a mother and daughter—also brought to fore the stigma that many still bear due to mental disorders. At least 17 parents with signs of mental illness allegedly killed their children from 2005 through 2015, while a similar number of children allegedly killed their parents. But the toll of violence reaches far beyond family. From 2005 through 2015, 10 percent of all homicides in Massachusetts in which a suspect is known were allegedly committed by people with a history of mental illness or clear symptoms. Many of those deaths might have been prevented had the killers received the mental health care they needed. Police in Massachusetts are increasingly called on to respond to mental health emergencies. It is a role police were never meant to fill, and the mismatch leads to tragedy. Police across the state shot people who were suicidal or mentally ill dozens of times in the last decade. [A]six-month Sun Sentinel investigation determined that people with mental illness have killed or brutally assaulted at least 500 loved ones in Florida since 2000. During that time, Florida’s spending on mental health programs has declined significantly … The result is a mental health system in crisis, one that too often misses opportunities to help the seriously mentally ill and prevent the violence. In a review of government records and interviews with relatives … the newspaper found: In dozens of cases, psychotic people were brought to hospitals, treated and released, only to kill themselves or a loved one within days, even hours; a lack of crucial follow-up care, secure treatment centers and accessible psychiatrists has fueled repeated emergency visits to hospitals; hospitals have discharged people without places to go, sending them out with bus passes or cab vouchers; lawmakers have rejected calls for more funding for safe, supervised housing for the mentally ill, leaving families with the horrible choice of taking in a volatile, unstable adult or casting the person out into the street, homeless. Both media organizations, in brief, find taxpayers and lawmakers all too eager to be penny-wise and pound-foolish in refusing to adequately fund mental health resulting, instead, in big expenditures for a last-resort in law enforcement, forcing police on the streets and in jails and prisons to deal with the too-often homeless, bereft mentally ill. (Washington, D.C., certainly sees its share of the nation’s mental health crisis, not the least of which shows up in the region’s unconscionable nightmares with homeless, a significant portion of whom clearly suffer from untreated mental illness). The Obama Administration and Congress, as part of the $6.3 billion 21st Century Cures Act, boosted the nation’s financial support for mental health, including raising its profile in public health considerations, as I have written. Still, this area of health care has been staggered since Reagan-era decisions to close some horrible, abusive public psychiatric facilities in favor of what was termed “deinstitutionalization.” But policy-makers failed, abysmally it is clear from a historic perspective, to provide resources needed so the mentally ill didn’t plunge through gaping holes in the social safety net that opened when public psychiatric facilities shuttered or downsized in huge fashion. Meantime, the online information site BuzzFeed provided one of the year end’s more eye-opening investigations, this one of the hospital chain Universal Health Services (UHS). Although BuzzFeed has pledged to use some its cheap, eyeball-attracting tactics like cat photos, top 10 lists (listicles), and celebrity gossip to support serious journalism, it hasn’t won serious attention in this way to match even many small newspapers—yet. A yearlong BuzzFeed News investigation — based on interviews with 175 current and former UHS staff, including 18 executives who ran UHS hospitals; more than 120 additional interviews with patients, government investigators, and other experts; and a cache of internal documents — raises grave questions about the extent to which those profits were achieved at the expense of patients. Current and former employees from at least 10 UHS hospitals in nine states said they were under pressure to fill beds by almost any method — which sometimes meant exaggerating people’s symptoms or twisting their words to make them seem suicidal — and to hold them until their insurance payments ran out. BuzzFeed has reported that some federal officials are investigating UHS facilities for Medicare fraud, while others are probing whether criminal violations occurred when patients were involuntarily committed. No charges have been filed, the company denies any wrongdoing, and it says it is cooperating with authorities as requested in multiple areas. The BuzzFeed reports includes interviews with patients who told how they responded to UHS facilities’ publicized offers to provide “mental health assessments,” which some curious individuals sought—only to find themselves detained and under forced care. Others said they had mental health needs, but after making inquiries about services and being told they had to discuss options in person, they, too, were involuntarily confined. This is scary stuff, again, with awful history and harsh echoes of totalitarian states, notably the Soviet abuse of psychiatry to punish the mentally ill—and to imprison political opponents. We’ll need to wait and see how the official investigations of UHS work through, of course. But in my practice, I’ve certainly seen abuses of authority, especially in bad practices by health providers, and I remain a staunch defender of our constitutional rights, including the right to be free and to excellent care for the body and mind. I was saddened like many Americans to see the back-to-back deaths over the holidays of Hollywood legends Debbie Reynolds and her daughter Carrie Fisher. Both will be sorely missed not only for their artistic accomplishments but also for their candor, courage, and deep support to remove the stigma of mental illness. 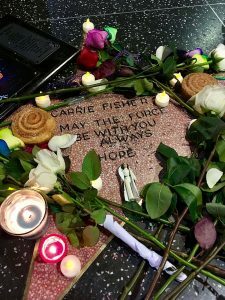 While Fisher was outspoken about her struggles with bipolar disorder, her mother was lauded, especially in Hollywood, for helping to raise tens of millions of dollars over a half century of volunteerism to combat mental illness.